If you’re looking for a simple-to-use fire pit for those cool falls night or an evening get together, a gas fire pit is probably the right choice for you. We spent over 100 hours testing various options and configurations, many of which were great and came to the conclusion that the Outland Firebowl Premium Portable Fire Pit is the best fire pit for most people. Its easy to use controls, compact size, and included extras make it an excellent value for its price. The Outland Firebowl is a capable propane fire pit that would be equally at home on a patio as it would be in a campground—and it’s much easier to use and transport than its competitors. 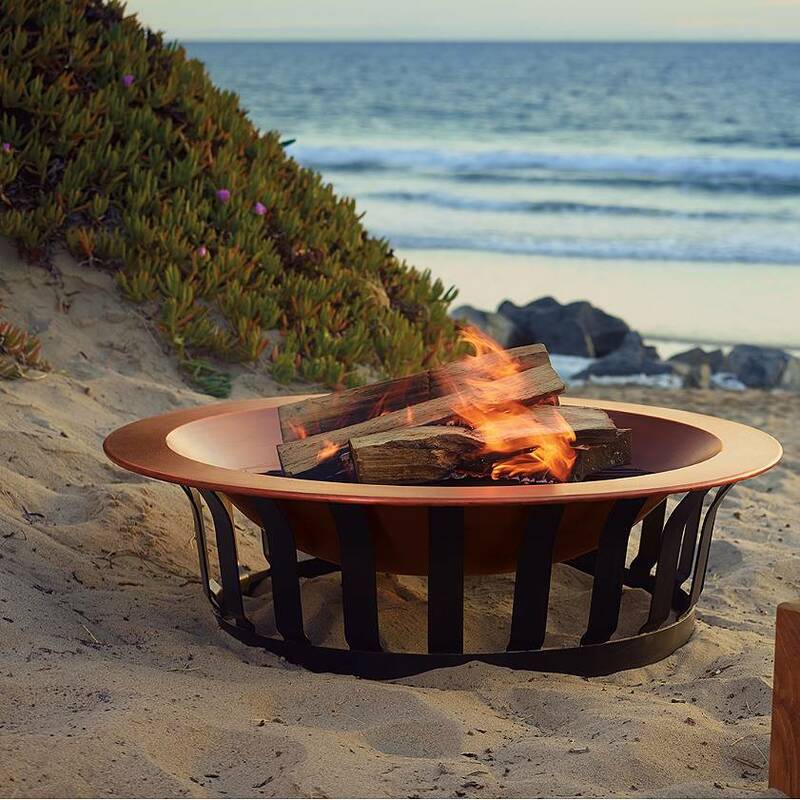 The Sunnydaze Cast Iron Wood-Burning Fire Pit Bowl is a perfect choice for those looking for more natural fire pit with a minimalist design that requires very little upkeep. When it comes down to high class options, the Outland Fire Table has the competition beat. With a beautiful glass tabletop and modern look it is an excellent way to upscale any backyard patio. If your here, there is a pretty good chance your in the market for a new fire pit. Whether this will be your first fire pit purchase, or you’re a seasoned fire pit connoisseur, you’ll want to know all there is to prior to pulling the trigger so you can be certain your getting the best fire pit based on your needs. As it stands there are hundreds of factors to consider, from fire bowl material selection, BTU rating, bowl diameter and more. This article will give you an in-depth guide to help you choose the right fire pit for your needs. We’ll show you what features to look out for, whether or not a propane or a wood burning fire pit it the correct choice and how to ensure you’ll get the most bang for you buck with whatever fire pit you end up deciding on. When it comes to fire pits, one of the first decisions you’ll have to make is if you want a propane fire pit or a more traditional wood burning model. 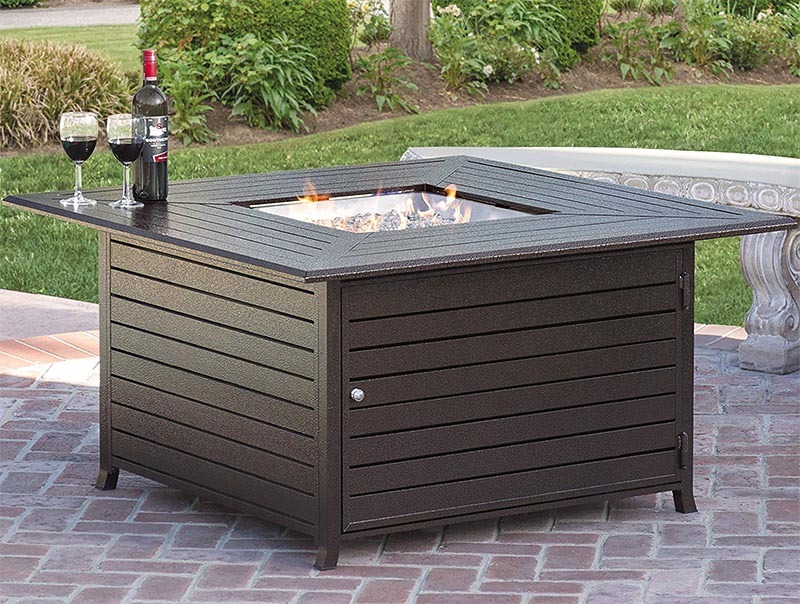 If someone asked us right now which is better, we would recommend a propane fire pit knowing nothing else. However as with most decisions, there is a lot more to it than that. Let’s first take a look at the main advantages gas fire pits. One of the key reason to go with propane over wood is the lack of smoke, soot buildup and need for firewood. Propane burns very cleanly and leaves absolutely no residue or smell on houses, RVs or clothing. In addition, because propane produces no smoke you won’t have to worry about playing musical chairs around your fire pit as the wind direction changes. If you’ve ever been around a real campfire you know just how bad the smoke can be after a quick wind direction change. In a heartbeat you can be left with lungs full of smoke and eyes that sting like fire. Now that’s not to say that all wood burning fire pit will have smoke. If you use nice dry season wood and have a hot enough fire you should have a smoke free blaze, but let us assure you, making a smoke free fire is an acquired skill which takes a while to master. On the flip side though, that feeling of staring into glowing coals and hearing the age old crackling of the logs simply can’t be beat. Smoke or no smoke, if your a true outdoor enthusiast you’ll want to go with a wood burning fire pit like the Sunnydaze. When it comes to how easy it is to start your fire for the night, propane fire pits win hands down. 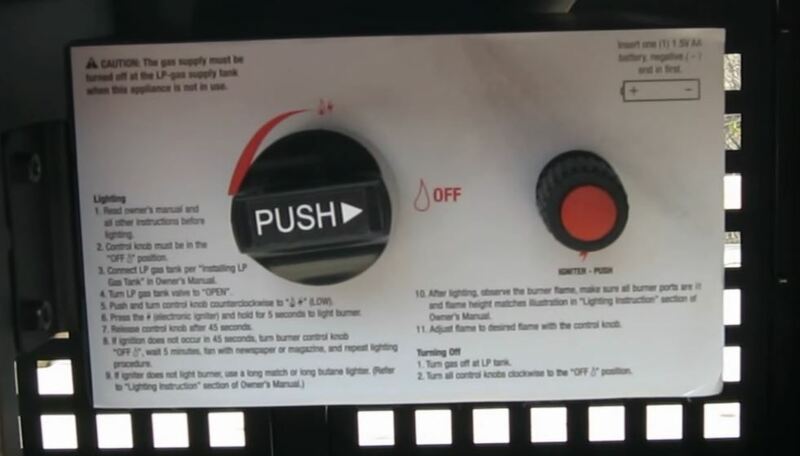 Almost all models including our best pick, have electronic ignitions and flame control adjustments. With a wood burning option you’ll simply have to use your bush crafting skills and a lot of lighter fluid. That’s not to say starting a wood fire is no fun though. It can be a blast to gather up your kindling, and build the perfect tepee to start the night off right. But if your looking for a quick flame to relax after a long day, you’ll want the simplicity of modern day piezo-electric ignition. One of the few downside to electric lighters is the are very prone to failure over time. The elements usually win the war when it comes to small electronic devices and after a few years you may have issues starting a propane fire pit using the built in lighter. If that’s the case you can either send it in for (costly) repairs, replace it yourself or just use a long match or lighter to get your flames going. If you opt for a wood burning fire pit, a hurricane could blow though and your fire pit would be no worse off. If you keep your fire under a vinyl cover though it shouldn’t be much of an issue unless you live in a very humid or ocean side location. As a side note, wood burning fire pits should not be used on wooden decks without proper precautions. These can include laying fire bricks underneath and having water ready in case an errant ember escapes. The a natural fire can really heat up the bottom of the fire bowl and cause wood underneath to burst into flames, not something we would want to happen. Propane fire pits on the other hand can be use anywhere there is proper ventilation, even under cover so long as the ceiling height is at least eight feet tall. The cost between a propane and a wood burning fire pit can be a major deciding factor as well. Typically wood burning fire pits will be far less expensive than their propane counterparts. This is mainly due to their lack of electronic ignition, low number of complex components and zero pressure containing gas hoses and regulators. 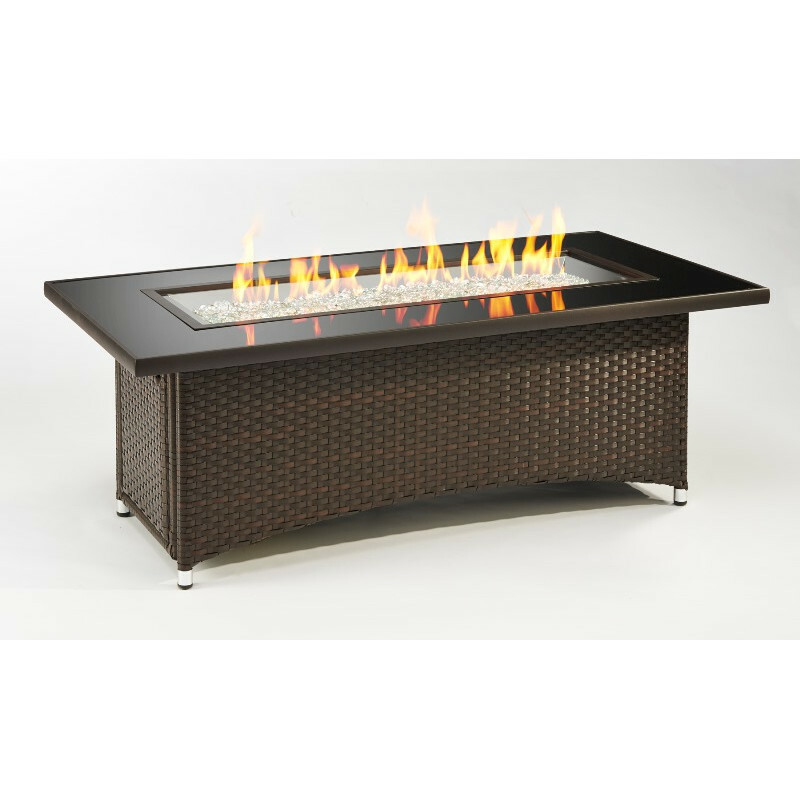 However when comparing entry level propane fire pits to top of the line wood burning options that price can swing the other direction. Almost all of the cost of a wood burning fire pit will be in the fire bowl itself. If you opt for a thin steel sheet metal bowl as opposed to a solid cast iron one, you’ll be paying a faction of the price. 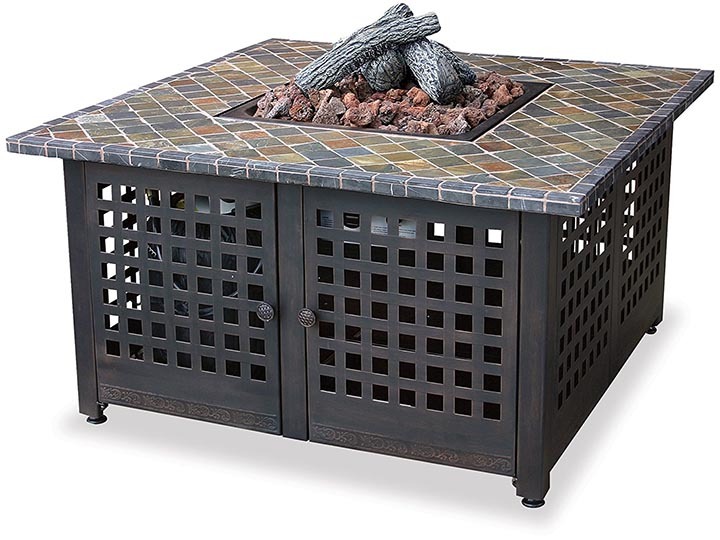 Likewise if your looking at a large propane fire pit table that seats eight adults you can expect to be paying quite a bit more than even the most expensive luxury wood burner. If you see a fire pit, whether propane or wood burning for under $75, you should probably take a look at the materials and build quality. 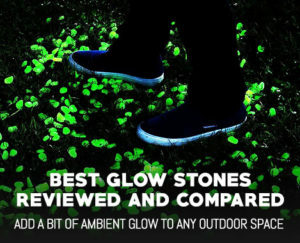 A lot of the time cheap materials and hardware were used in its construction which will quickly corrode in the elements or in the case of really low quality products, burn completely through after a few uses. Each time a fire is lit a little material will be removed from the fire bowl as it heats up, the thicker the material, the longer it lasts. 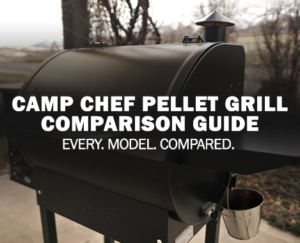 So there you have it, a quick breakdown of a wood burning fire pit versus propane fire pits. There really isn’t a right answer for which one you should get, but a good rule of thumb is if you’re in a smaller or very dry space, opt for the safer propane models. If your bit more experienced or have a larger backyard and preferably a concrete patio you can feel free to grab a wood burning one. A fire pit can come in a varieties of materials ranging from steel and copper to cast iron and aluminum. Each has various advantages and disadvantages when compared to the the others. Lets go ahead and list the important metallurgical information then break it down into a usable form. As you can see from the table above there are four main properties we focused on for each material: hardness, melting point, weight/density and tensile strength. Each of these plays an important factor when it comes to fire bowl construction. Now, you can clearly see where some materials have advantages and disadvantages. Some are light and flexible like aluminum, while others are hard and heavy like cast iron. Overall Steel is generally a very safe bet when it comes to a fire bowl materials, it is hard, very difficult to melt, quite flexible, but heavy. Cast Iron is also a great alternative if you don’t plan on banging it around as much. Aluminum has the upper edge when it comes to portability which is why most of the very light fire pits use this as their preferred material. The only odd material out of the bunch is copper, with its heavy, not quite flexible and very soft properties. This material has one key advantage however, good looks. It is by far and away the best looking material in our option and brings a great deal of style to your backyard if you choose to use it, a good example of a copper fire pit is the Titan Attachments Frontgate Copper Fire Pit Bowl shown above. 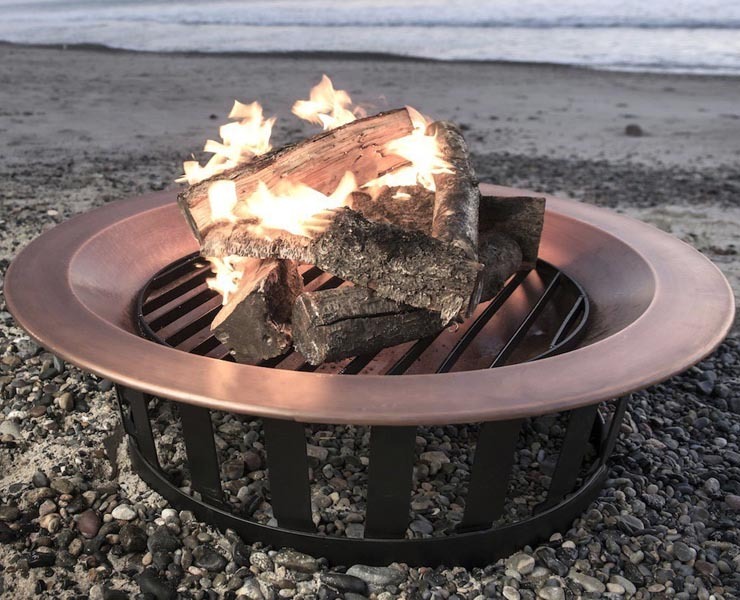 Take a look at our article on the Best Copper Fire Pits for a few great copper options. 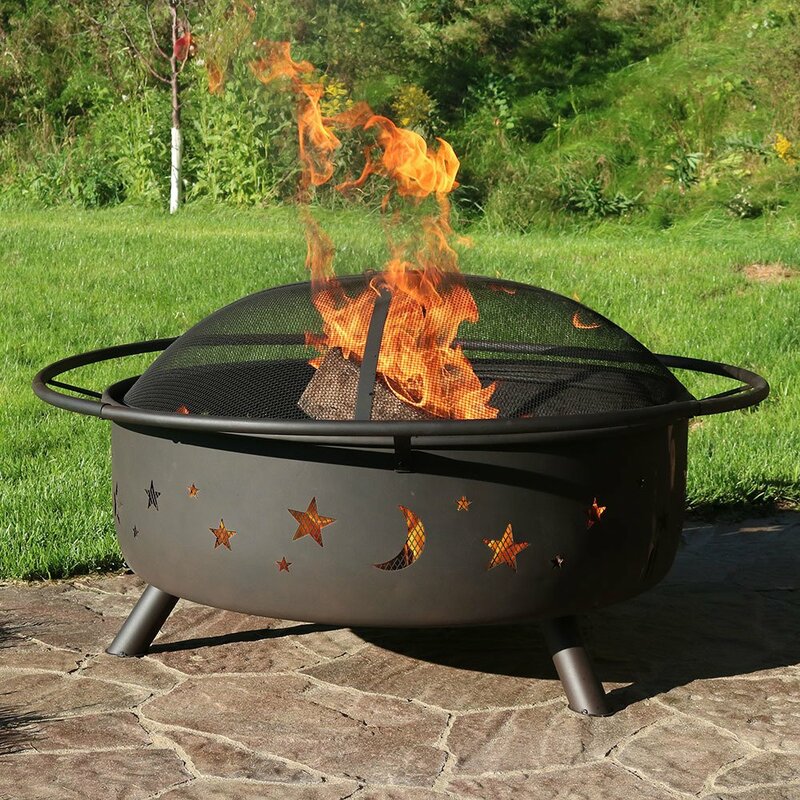 The Sunnydaze Cosmic Fire pit is an awesome wood burning option that gives a classic design a new lease on life, especially with the included spark screen and safety bar. 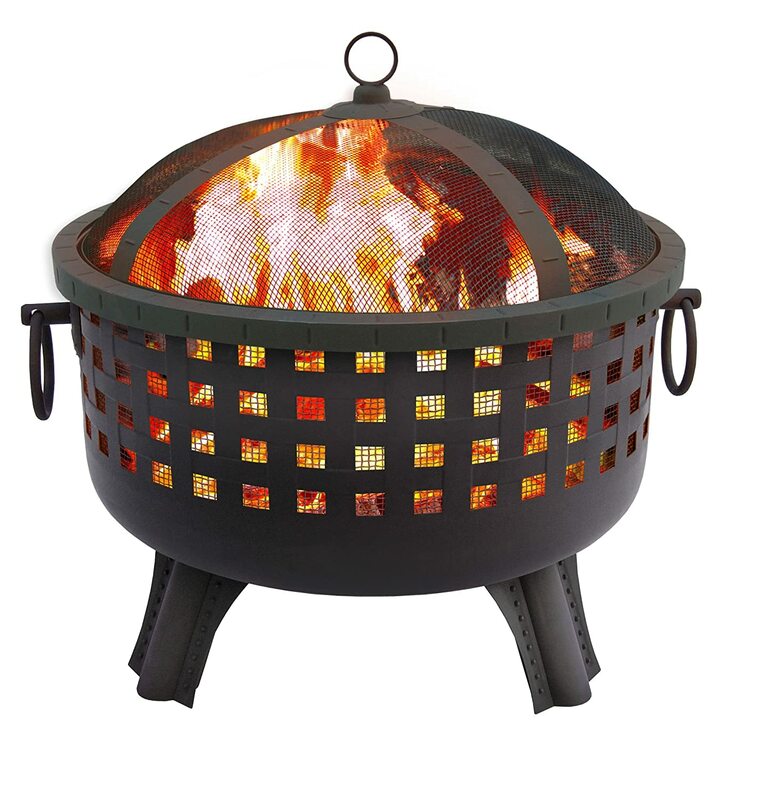 The Landmann Barrone Fire Pit is a mix of contemporary and old world style. 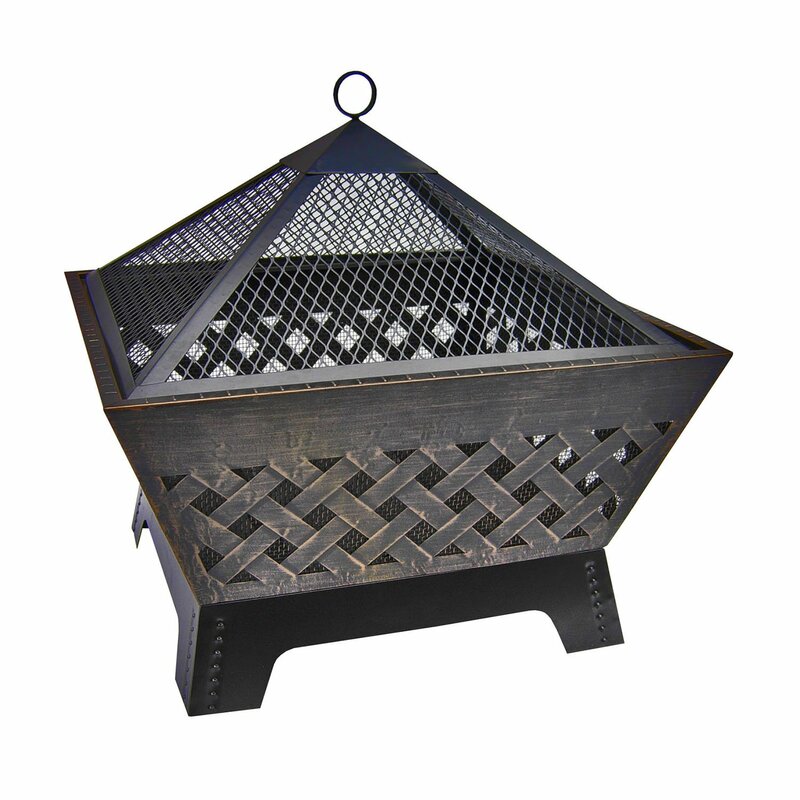 With a deep fire bowl and angular design it is perfect for any patio. When it comes to beautiful looking fire pits the Titan Attachments Frontgate 40″ Copper Fire Pit Bowl has the looks to beat out the competition. With an elegant dark brown finish and a refined look, you’ll be impressing dinner guests and grabbing the neighbor’s attentions the second you fire it up. 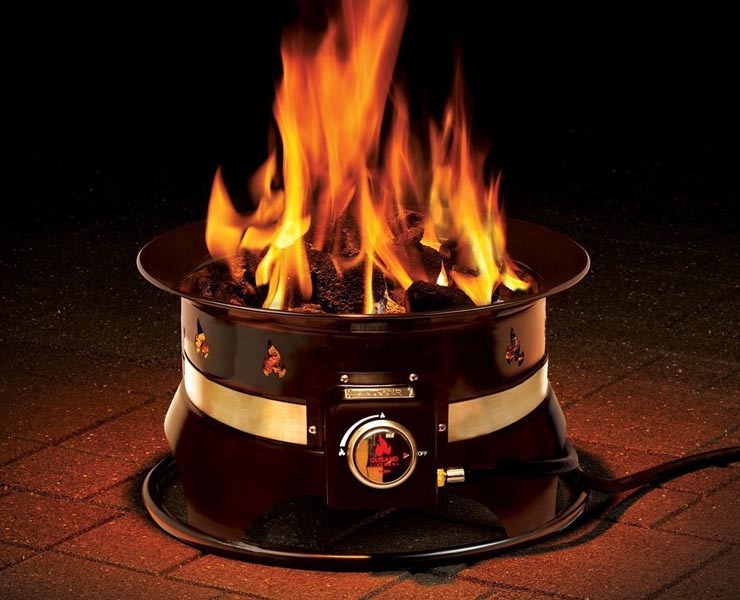 As with anything that is expected to remain outdoors you’ll need to take precautions to ensure your fire pit lasts for many seasons to come, even the best fire pit available needs a bit of protection. One of the worst enemies of fire pits is water, whether this is from rain, condensation or humidity you’ll want to keep it away from any exposed metal components. The easiest and most effective method to protecting your fire pit from water is by using a vinyl cover. They come in many sizes, shapes and colors but all provide the same functionality. When choosing the right cover you’ll want to grab one with thicker vinyl material. A lot of the thinner covers have trouble keeping out water during heavy rain storms. A second item you want to keep an eye out for is seam seals. This is basically a clear coating over the seams that keeps water from leaking in between the threads. Getting a form fitting cover is also a great help when it comes to the wind. A generic cover might blow off whereas a cover built for a specific fire pit will fit like a glove and typically have shock cord pull strings to ensure it stays in place. As we detailed in the material section, steel is a great choice when it comes to making a fire pit with its hardness and high heat resistance, but as most people know it is very prone to rusting. 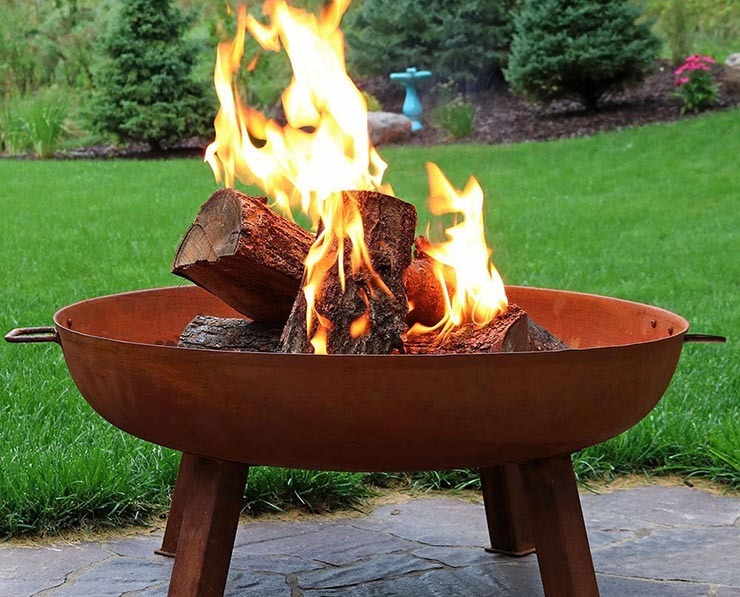 While fire pit manufacturers to try to put rust resistant coatings on many of their products, the assembly line nature of them mean the coating is typically not very effective. Because of this we almost always recommend you give your new fire pit a coating of high temperature rust proof paint. This will help prevent rust, reduce heat damage and allow you to enjoy your fire pit for many years to come. 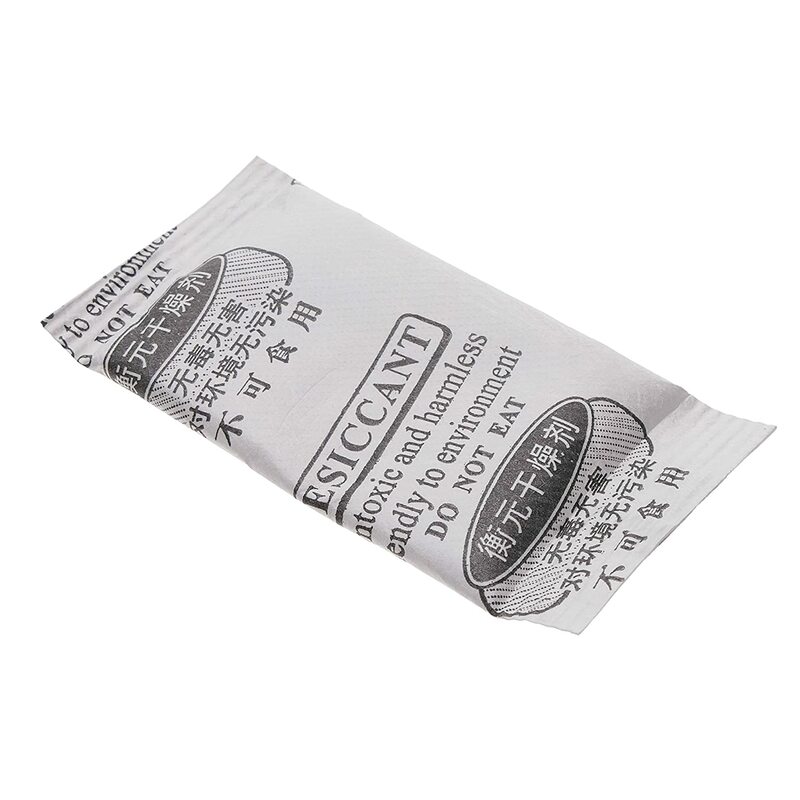 If your storing a fire pit indoors or in an RV you will want to get a few desiccant (water absorbing) bags thrown into the fire bowl, this will help absorb any condensation that creeps under the protective cover. If you plan to keep your fire pit outside, it is a good idea to make sure it has adequate drain holes. Usually two to three 3/8″ holes are more then enough to ensure water can drain out the bottom. We’d recommend you drill these holes even if you plan on using a cover, but keep in mind these are exclusively for wood burning fire pit, propane fire pits should have built in drainage. The last item on the maintenance list is to shovel the ashes out of the fire bowl every so often. Leftover ashes can eventually choke a new fire and keep it from burning correctly. Fire pits need sufficient oxygen to obtain a clean hot burn and they get that through both top and bottom air flow under the logs. A few minutes of cleaning will go a long wait to keeping your fire pit burning bright and hot on even the coldest of nights. Well there you have it, an exhaustive guide about choosing the best fire pit. We’ve gone over the pros and cons of wood burning vs propane fire pits, material types, cost analysis, and more. By now you should have a pretty good idea of what to look for and how to choose the best fire pit for you. 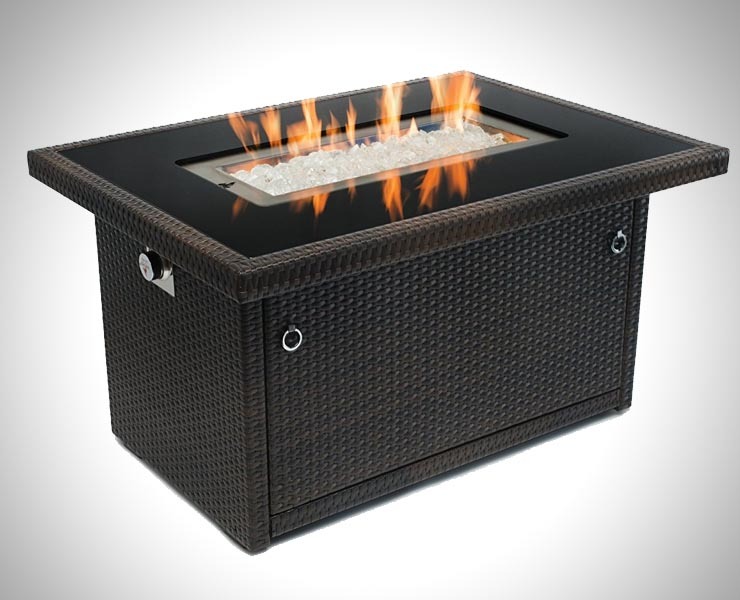 If your just starting out and still a little lost as to which to pick we’d recommend going with our top pick for the best propane fire pit, the Outland Firebowl Premium Portable Fire Pit. There is just something to be said for soild build quality, reliability and portability.